Not running 150 miles for the past couple weeks has freed up a bunch of time for me. I spent a little while redoing some things on this blog. I don't have many followers, but for all that read this, above this post, right below the main picture is a list of separate pages that will bring you to the information that used to be along the right side. One considerable addition is the 2011 Race Schedule. I changed a lot of things to my original plans from the beginning of the year to to one big thing. Much of you know that while at Shawnee State I have ran four years of cross country but the school has never had a varsity track program. We still went to big meets to race on the track but was never able to compete at conference or Nationals. Well, big news came in last month that we are allowed to run as a varsity team this year. During the cross country season I had full intentions not running track and start focusing on ultras for good, but this turn of events has me back focusing on a track season - with a slight difference still. Strangely enough, the NAIA has the Marathon as an event at Nationals (not ran on the track) so that is going to be my focus. Along with that, I might compete in the 10K at a couple meets like All-Ohio and conference. To qualify for Nationals I need to run 1:14:00 for the "A" standard or 1:16:30 for the "B" standard in any half-marathon before then. I plan on doing that April 3rd in Athens. So, training will not be much different than I have did in the past - I plan on taking things a lot slower in terms of mileage build-up and total miles though - no more injuries! After the marathon I will be re-evaluating how I feel. 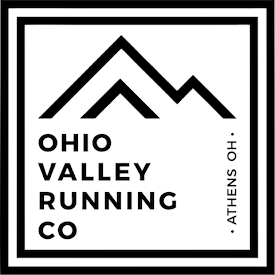 I don't want to get too ahead of myself and start setting my training schedule for the entire summer - I still plan on gearing up for the Burning River 100 and now with the recent news of the UROC 100K, that too. As far as running goes for me currently: I am back running, just not nearly as much and my achilles is feeling good. More time is being spent on school work as well, I have a lot of writing to be done this semester and I volunteered to do play-by-play for baseball games on Shawnee SportsNet, which should be up and running within the next week. Oh, almost forgot to mention - today I am 22 years old. "All of us at the top of the "sport of ultrarunnning," have jobs. We just don't have the 9-5 routine. It's simple, we work to live, we don't live to work. There is a big difference. One of the reasons some of us are fast is because we scrape to get by so we have more time to run. Pretty good evidence that we do it because we like it, not to satisfy anyone else." take care!! try to come to back to back hurricanes again, and I think grossman is going to do a 3 day run over memorial day weekend on the AT as well. I'm going to try to run all three days some.. but will def help crew and have some aid stations set up at road crossings. Sounded good when I sang it - but somehow typed words just don't do the thought justice. You have a great day! From Mammaw, Karhu, Abby, Maggie, Peppie, Goldie, Bootsie, Fluffy, and of course, Pappaw!! Happy Birthday and I'm excited for you and your new goal/s. . . exciting stuff. Do it while you can and take advantage of the college experience and competition! I hope to see you at UTMB in a couple of years (I am not quite ready for it yet). That is awesome... the half marathon in track! Pretty sweet. Did you mean they have both the full and half, or just the half? They just have the Marathon at Nationals. To qualify, you have to run a half marathon before then. Primarily, a bunch of seniors that know that can't qualify for track events run it. haha. it should be fun though. Regardless, a very cool opportunity. Any other divisions doing marathon stuff besides NAIA? Where do you run the national's race?